I had the most amazing one year of flawless thick hair from the time I got pregnant till the time Baby Hashtag turned three months old. Come the day when she turned four months old and I noticed something I hadn’t seen in a very long time. Hair on my pillow! And it shook my world! I am not being hyperbolic but I was looking at my thick long locks strewn all over the pillowcase and I was seeing this after a year. I brushed it off as a one-off incident. Later that day after I washed my hair I noticed the same pattern. I expressed my concerns to my mum and she told me that often in the fourth month post delivery, the mother tends to lose all the sheen and hair that she had gained all through the pregnancy. Of course, I knew that. But I wanted to believe that it would happen at a normal pace and not as drastically as it was happening then. Anyhoo, two months into the hair fall, I have still not learnt to live with it. I tried a fair few products because you can only do so much when you have an infant to take care of, all by yourself. I had pretty much given up really, while fellow mom bloggers consoled me saying that the hair fall will eventually reduce. Also, the market for products for new mothers is sadly ill-stocked. If there was a product that would have specifically addressed my issues, I would have tried it instantly. Turns out I did not have to wait for long. Mamaearth, my favourite baby products brand presently, has come out with their mama range. There is a whole range of products that have been designed specifically for new mothers and mother-to-be and I was super pumped to have tried a few of their products before they officially launched on Mother’s Day. I will definitely talk about their entire range in a separate post but this time I am exclusively reviewing their Hair mask. 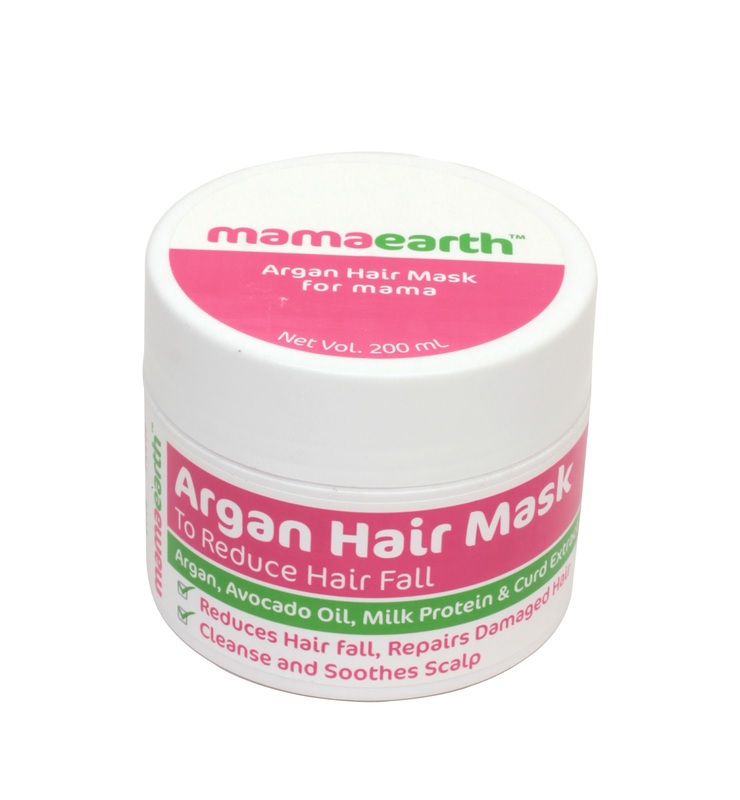 The hair mask is aimed at helping the mums deal with increased hair fall and damaged hair. 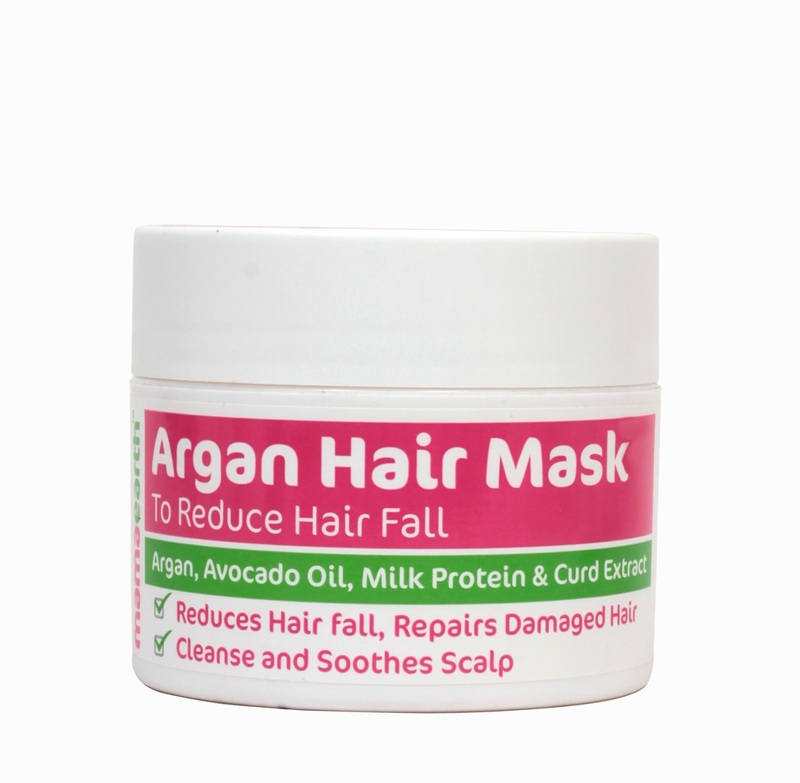 The formulation boasts of being induced with Argan, Avacado Oil, Milk proteins and curd extracts, all of which are nourishing ingredients for a healthier scalp and shinier hair. The product has a creamy non-drip consistency and comes in a 200 ml packaging. The packaging is simple and attractive. The pink and the green colours of the font and the banner are quite attractive. I, however, would have liked a little more vibrancy just like their packaging of the baby products. Their is an additional lid inside that contains the product from spillage. The hair mask can be used a leave-in conditioner or it can be washed off as well. I have been using it for four weeks now and tried both ways to use this mask. My hair tended to get oilier faster when I used it as a leave-in conditioner when compared to washing it off. But in both instances, I was left with shinier detangled hair and they honestly look better nourished than before. The mask has worked wonders for me but I honestly do not care for its smell, it is slightly overpowering and takes time getting used to. But Baby Hashtag had no problem with the fragrance so its a win-win.